Nonstick coatings on cookware and bakeware provide for healthier cooking because they need less oil. But improper care can ruin the beautiful finish on nonstick pots or baking pans, causing foods to begin to stick and the finish to peel or chip off. It will also make cleaning your nonstick pots more difficult and reduce their lifespan. Though some nonstick finishes are hardier than others, there is a limit to how much heat and basic lack of care that they can take. If you don't want to have to replace your nonstick pans and skillets, being proactive with care is an absolute must. 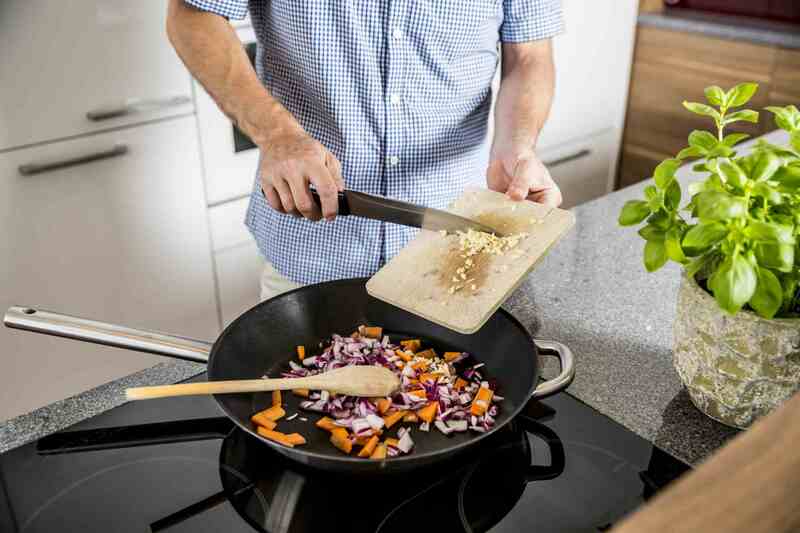 We listed the most common ways you can ruin a non-stick pan or skillet if proper care and maintenance aren't applied. Protect your non-stick cookware or bakeware investment by avoiding these mistakes and you will enjoy your non-stick pots and pans for many years. Understand that nonstick pans do not last forever, as you would expect from quality stainless steel. Even with the best of care, they tend to have a shorter lifespan. Cutting desserts or meatloaf right in the pan with a metal knife or utensil can pierce the coating leaving your pans unsightly, cause foods to stick and rust to form. When making desserts for transport to a potluck dinner, for instance, bake it in a disposable pan. Helpers might use metal servers or cutters to slice your dessert loaf, so keep the good pans at home. Use rubber or silicone spatulas to divide and serve from your cookware or bakeware. When possible, remove from the pan and cut on a cutting board. Storing pans haphazardly along with other metal implements can cause scratches or dings in the finish. Always nest your nonstick frypans and bakeware carefully, and do not allow anything with sharp edges to sit inside or touch your pans. Some baking pans will nest well with like pans, or you can place a paper napkin in between pans and different sizes of skillets. 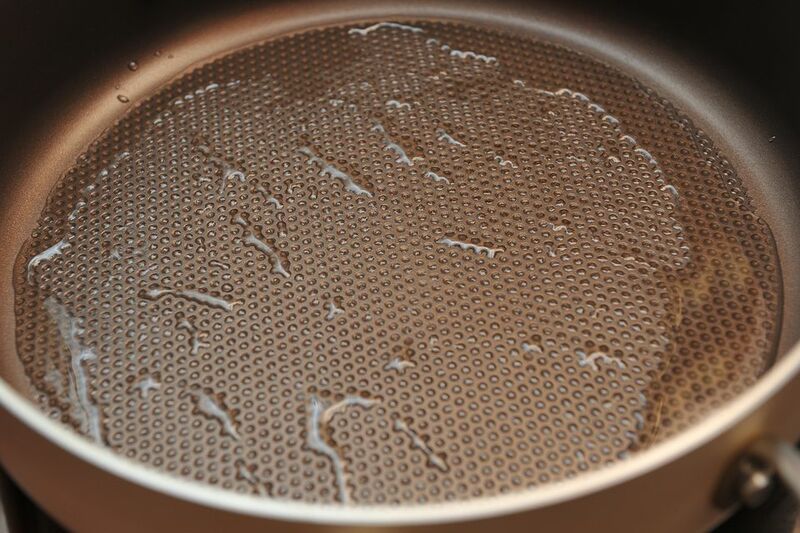 Placing a very hot non-stick frypan into cool or lukewarm dishwater can cause your pan to warp. Severe warping can cause the finish to buckle and peel. And a warped pan will not transfer an even heat distribution and cooking performance will be reduced. Always allow your pan to cool completely before immersing it in water. Refrain from using any metal utensils in your nonstick to stir, turn food, scrape food residue, or blend or remove foods from the pan. The best utensils to use are wood, plastic, or silicone. Many companies are now making silicone whisks which are terrific for that quick blending. Even occasional fork-turning can nick and scratch your pan. Also, note that some plastic spatulas are rigid and edges can be sharp. Using scouring products that are metal based or have harsh cleansers, can wear off the coating on your pans. Always use plastic scourers or soft sponges. Allowing your pan to soak for a moment will usually loosen foods and enable you to clean it with just warm water, mild soap, and a soft cloth. Make sure it is thoroughly cleaned, though, because even a little food residue will begin to harden when heated up. That will make your nonstick pan not so nonstick. Dishwasher detergents generally are too harsh for most nonstick cookware and kitchenware, and will eventually cause the finish to wear off. Bakeware that has scratches on it may also not dry completely and could rust. Handwash your nonstick implements and dry completely before storing. Most nonstick cookware is made for low to medium heat cooking. Too high a heat can wear down or blister the finish, as well as cause pans to warp. To maintain your pan's finish and increase its lifespan, follow the manufacturer's instructions regarding cooking heat. Foods should never be stored (even just overnight) in the pans. Instead, transfer food to a proper storage container and carefully clean and dry the pan before storing. Cutting your pizza right in the nonstick pizza pan will mar the finish. Always slide your pizza out onto a wooden cutting board, and then apply the pizza cutter to portion servings. Nonstick bread pans provide for easy removal of freshly baked bread. But using these same pans for meatloaf or other foods will wear off the finish quicker, as some foods reduce the lifespan of your pans, making them harder to clean and more prone to rust. Keep bread pans just for bread and designate another pan for meatloaf or other foods. This way you'll ensure no pan residue ends up on your freshly baked bread.